Wake up is at 5 a.m., if you are sleeping in Puerto Chubica (as we were) you can watch the sunrise over the salt flats. After sunrise you will have a breakfast of pancakes, jam, and dulce de leche, complete with moccacinos (hot chocolate, instant coffee and powdered milk). 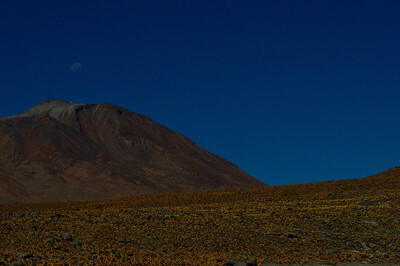 Leaving Puerto Chubica and the salar, you will head to San Juan to pick up supplies: Chilean wine, orange drink, chips... (Note: Depending on your jeep situation the previous day, the small town of San Juan could actually be your day 2 starting point). If your group is organized, you can start the day ahead of all the other groups and at least feel like you are not visiting the desert in a convoy of 30 jeeps. We were actually very organized group, but given our situation, we followed the "last is first" method, in order to have the sights to ourselves. 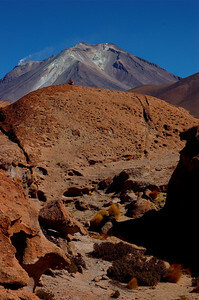 The first stop of the day is a vast plain of volcanic rock formations, with views of the smoking active Volcano Ollague in the distance. The rest of the morning is spent driving through barren, rocky terrain. On some of the steeper trails, all the passengers have to walk (especially if you don't have a spare tire). You can request stops to admire the packs of Vicunas (llamas with long silky hair) grazing in the distance. 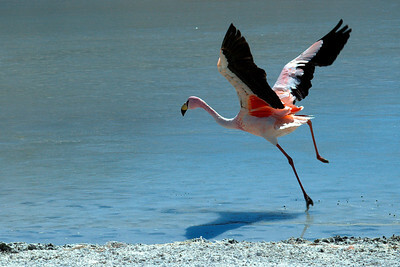 For many, the most impressive sight of the day will be the thousands of South American flamingos. 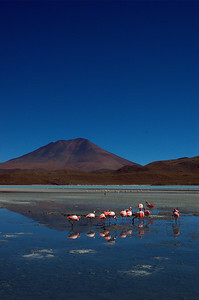 These flamingos only inhabit the high altitude (over 3000m) salt lakes and lagoons of the Andes. They are pink due to the beta-carotene contained in their algae diet (the source of beta-carotene the African flamingo's diet is shrimp). You will have your lunch at Laguna Hedionda where you can watch this endangered bird eat, fly or just stand around on a leg. The only thing that detracts ever so slightly from the experience is the raging stench of flamingo poop. The first stop after lunch is the rock forest. 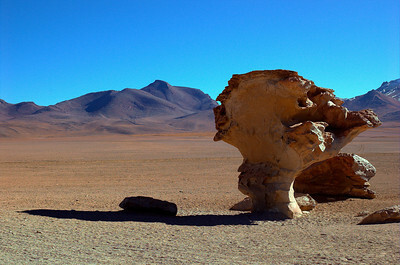 You might question the enthusiasm with which it will be presented to you by every single tour operator in Uyuni. The wide-spread belief seems to be that the most interesting thing on the tour is the Arbol de Pietra, a rock shaped like a tree. 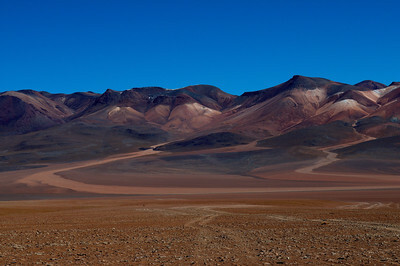 In the afternoon, the colours and shapes of the desert terrain seem to change every few minutes. 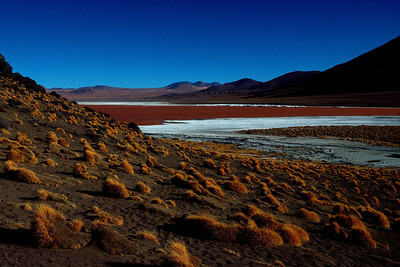 The last sight of the day is the Laguna Colorada, sitting at 4300m, red from algae and plankton with shiny white deposits of minerals colouring its banks. 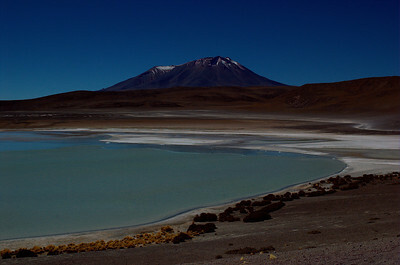 By the time you arrive at the lodge just past the Laguna Colarada, you will have traveled for more than 12 hours, covering almost 200km. You will appreciate the wine purchased in San Juan and the spaghetti dinner, especially when the sun sets and the temperature drops to -20C.